Kharikhola, Waku and Kaku are small villages in Nepal, approximately 2000 meters above sea level, several days trek south of Lukla, which is the starting point for treks northward to Everest Base Camp.Several international efforts seek to work with and for the inhabitants of Kharikhola, while Waku and Kaku have yet to receive much support for their own development.These efforts include some funds in memory of Mariane and Dorothea Heyerdahl to improve the educational opportunities in Kharikhola, Kaku and Waku. Mariane (2.6.1891 – 28.5.1984) worked for decades at an orphanage in Southern Norway; Doro (8.12 1894 – 25.4.1988) worked as a teacher in several Norwegian towns and villages. Doro discovered and encouraged the poet Jan-Magnus Bruheim in Sjåk, and the poet Tor Jonsson while she taught in Lom. 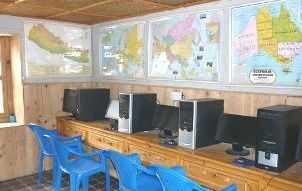 – internet connections and more English training for Kharikhola High School. – training to empower the women and parents of school children in Waku and Kaku, provided by Taksindu Social Welfare, a local NGO.